Farmers Market Coalition: Tell us all about Dillsburg Farmers Market. Melissa Jacoby Thomas: Dillsburg Farmers’ Market has been firmly rooted, literally and figuratively, in the heart of our small town, even from the very beginning. An area businesswoman and advocate for “all things local”, Yvonne Laukemann, loved supporting area farmers’ markets so much that she felt her hometown should have one of its own. In 2010, with a vision to promote farmers, growers and chefs in the local community who market directly to consumers, Ms. Laukemann started Dillsburg Farmers’ Market in the parking area of her antique shop, located in the center of town along the main street. Growing from 6 vendors the first year to 18 vendors this past season (2015), the market thrives on the enthusiasm of its wonderful customers, an abundance and variety of products from its loyal vendors and the many hours of its all-volunteer board (comprised of vendors and Ms. Laukemann). Through the seasons, the array of products has evolved and grown to include: homegrown vegetables and fruit; farm-raised meat and poultry; free-range eggs; shiitake and oyster mushrooms; homemade baked goods; raw honey and products of the hive; value-added products like jams, soups, sauces, sauerkraut, juice and cider; bedding plants, perennials, edible and native plants, shrubs and trees; homemade soap and soy candles. Guidelines for vendors are: 1) be producers of their own homegrown/raised and homemade products within 50 miles of the market; 2) be licensed and certified according to Dept. of Ag. requirements for their products; 3) be appropriately and adequately insured for farmers markets. Our open air, rain and shine, producer-only farmers’ market operates each Saturday at a single location from the third weekend of May through the second weekend of October (with an “extended season” late Oct. through early Dec.). We attract between 500 – 800 customers each Saturday, which is significant in a fairly rural area where many people have yards with space to do some type of small-scale gardening of their own – yet they support the farmers’ market, too, for products unique to what they raise at home! A predominantly rural/small-town (yet bustling!) community, Dillsburg is conveniently situated along a well-traveled route between the state capitol, Harrisburg, and the historic town of Gettysburg. Farming life and legacy are revered in our community, from the annual Dillsburg Farmers Fair celebration each October to the active FFA and Farm to School programs in our school district. Our local historical association holds colonial agricultural demonstrations and events at its 18th century Dill’s Tavern and Plantation. 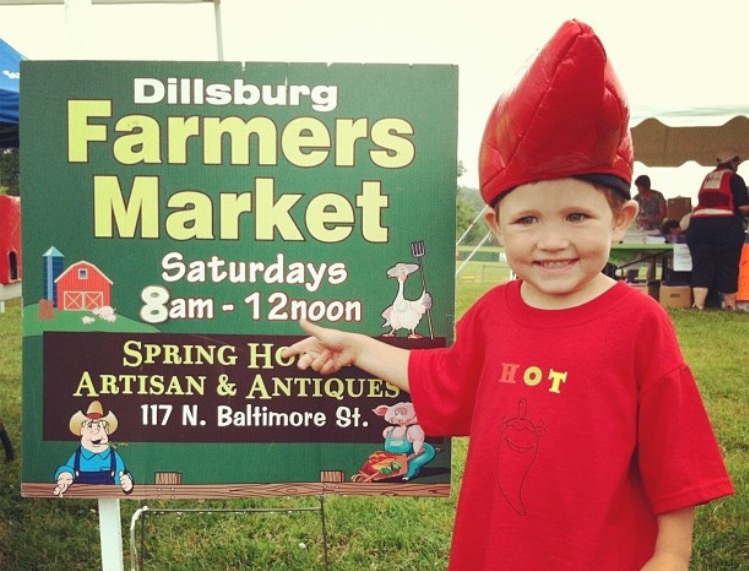 FMC: How does Dillsburg FM inspire its community to come out to market? MJT: In early May, before the market’s opening day, we take a booth to Dillsburg’s annual spring street festival event where we hand out free postcards and food guides and vendors bring small “preview” inventories to sell. During the local library’s children’s summer reading program, children can redeem reading reward coupons at our market for produce and products donated by our vendors. For National Night Out in August, our vendors donate free product samples (including ALL the tomatoes and onions for the picnic cookout for 2000+ participants!). Every few years, vendor volunteers and friends build a market-themed float for the annual Farmers Fair parade. Our market has joined the local business association and also presents short educational programs about farming and local and healthy food at the library, senior living and childcare centers and schools. Each market Saturday, May – Oct., volunteers donate materials and content for a free hands-on kids’ table (with a “guessing box”, seasonal fruit or veg learning concept and a related kid-friendly recipe), plus interactive displays like: fruit and veg “sculptures”; painting with veggies; “pumpkinspiration” for jack-o-lantern decorating; “anatomy of a healthy school lunch”; take-home transplants in newspaper pots; special guest reading day by the children’s librarian, conversational cucurbits, farm photo booth and lots of healthy fun! We also host a community table frequently through the season, inviting Master Gardeners, the Bluebird Society of PA, historical agriculture personnel, local high school FFA students and our town’s Farmers Fair committee to meet and greet customers, set up displays and answer questions. We feature live music on occasion. Some of our grower vendors are authorized farms to accept FMNP and SFMNP vouchers. FMC: What do you do to promote your market? MJT: We use Facebook, Instagram, Twitter, Local Harvest, AgMap, Farmer’s Pal and a weekly update to our customer email subscribers. Our local newspapers are also very accommodating to us during the market season with print ads and a “menu” of what customers will find each Saturday morning. Joining our local chapter of Buy Fresh Buy Local, the Gettysburg Wine and Fruit Trail, and Farmers Market Coalition helps put our market “on the map” and connects us with like-minded locavores and other farmers’ markets. Word of mouth reviews from our customers to other folks is our most valuable promotional tool! FMC: What are some challenges faced by Dillsburg FM and how do you work to overcome them? MJT: Our market faces challenges like many other markets: rain during market hours (our farmers welcome rain any OTHER time but Saturday morning! :); building and keeping a balanced “mix” of vendors, and measuring our progress and continually striving for the best ways to serve our customers. To meet these challenges, we implement customer and vendor surveys, count foot traffic on Saturday mornings and assess our outreach numbers on social media platforms. (We have yet to find a way to “schedule” the weather – ha, ha!). We have celebrated many successes through the years, from the tremendous support of our customers, connections we make through a priority for fresh local food that we share with so many in our community, and the dedication of our vendors to return year after year. FMC: What makes Dillsburg FM so special? MJT: What makes our market special? It’s more than “just” a marketplace – it’s a shopping trip and a social experience. It’s a gathering place for neighbors and newcomers. On a typical morning, you might overhear conversations about tomatoes, an upcoming church potluck dinner and the easiest directions to the kids’ soccer tournament, all at the same time. Parents, children, grandparents, college kids and millennials – all with different ideas for how they’ll be spending the rest of their weekend – start their Saturday mornings at our market! And our vendors are always happy to take a moment to say hello, ask about last week’s purchases or share a bit of farm “news” or a favorite recipe idea. Get on over to Instagram and follow Dillsburg FM’s story!